When a business experiences disruption, prompt action must be taken. This blog chapter discusses first step of any corporate transformation, which is to clearly assess the complete current state of the business, and the likely outcomes if no corrective actions are taken. The single most important element of defining the Current State is a blunt assessment of the true state of the business and an in-depth analysis of the root causes responsible for the company’s current situation. This is typically much easier for an incoming leader than for a founder or existing leader who was surprised by a sudden business downturn. Nevertheless, without the first step of understanding and acknowledging the root causes of the current situation, no progress can be made. New to this blog? Get an overview here. Assessing the Current State entails an examination of the market, customer, and internal factors contributing to changes in the business, and an analysis of the true root causes of the business disruption. Did the market or customer buying patterns change? Did the company not anticipate customer needs or maintain sufficiently high customer satisfaction? Did an innovative and faster-moving competitor insert itself into the customer base? The Business-as-Usual Outcome is 1) a high-level analysis of the likely impact of these market and customer trends on future business, 2) the likely impact to the business if no changes to the company’s internal operations are made, and most importantly, 3) the timing of when those factors will manifest in the business. The rapidity with which the Current State will transform into the Business-as-Usual Outcome will help set framing parameters for the speed and extent of the immediate-term actions outlined below. 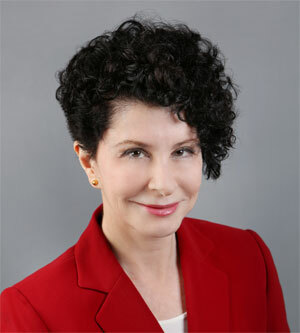 For example, a company in which a “cash cow” business is slowly declining, but with clear visibility through long-term contracts to a modest rate of future revenue declines over a multi-year period, requires very different actions than a company that is low in cash, in a loss situation, with rapid declines in its core business coupled with an acquisition in which the acquired company’s revenue declined catastrophically post-closing – i.e. both significant revenue declines coupled with significant increase in the expense basis coupled with minimal cash reserves. 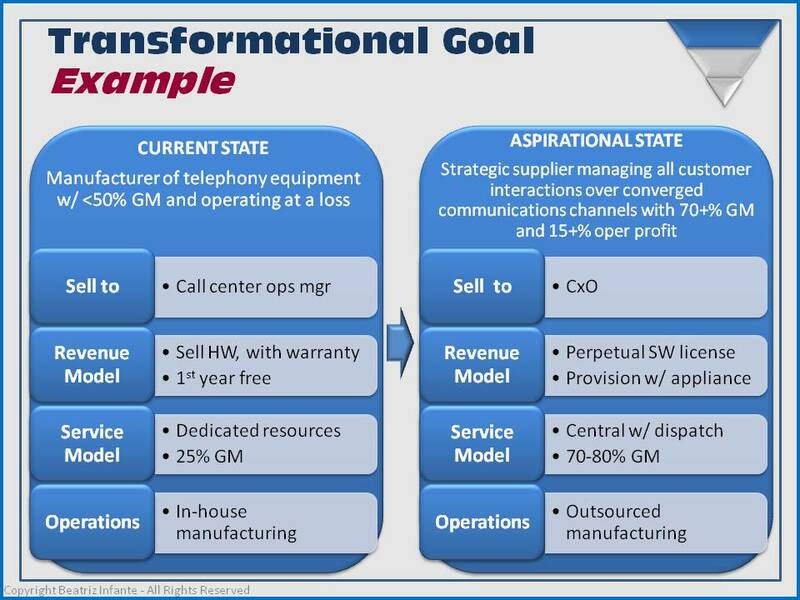 The former company must transform itself, but likely has a year or two to achieve significant changes; the latter must take immediate action that is likely to involve significant restructuring and workforce adjustments in a timeframe of two months or less. The actions taken must be bold to avoid a significant loss of shareholder value. Even in situations which are relatively well-understood, it is still important to quantify the potential results of inaction in order to determine the urgency for transformation. In particular, if the need for transformation has been precipitated by a crisis such as an unanticipated and rapid decline in revenue, it may be easy to dismiss the situation as a one-time event rather than a warning sign of a more systemic problem. Especially if the company has been historically over-optimistic and focused on potential positive outcomes without adequately understanding the potential downside risks, it is very likely that no one fully understands the extent of the risk to the business. It’s highly likely the company is in denial about the potential extent of business degradation and likely outcomes if no actions are taken. These downside risks must be discussed and understood because no leader operates in a vacuum. Transformations are extremely difficult undertakings and require focus, commitment and dedication. A leader who hasn’t built support for the end state within their management team or board will not succeed. 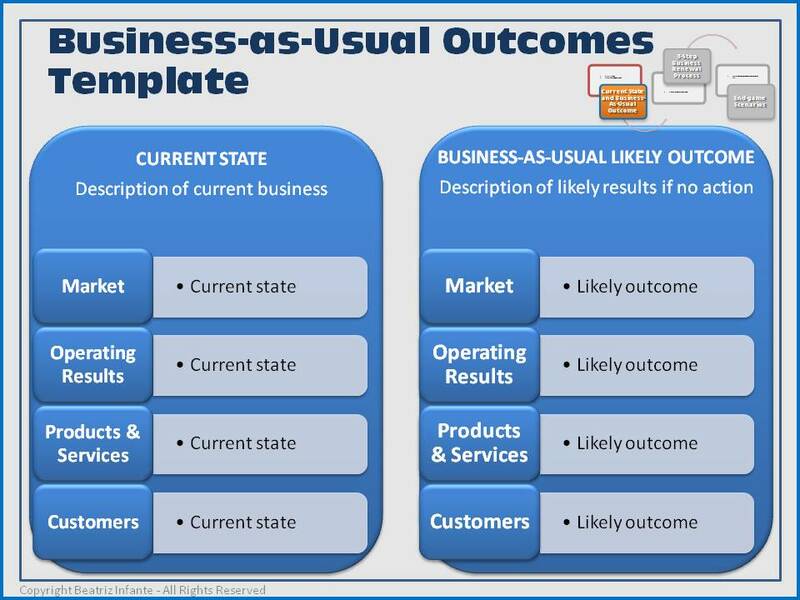 The Business-as-Usual Outcomes provides a qualitative and quantitative analysis of the result of inaction for four key metrics: Market & Competitive, Operating Results, Products & Services, and Customers. The analysis should include downside models of varying degrees of revenue and margin degradation, which will serve as the basis for determining the necessary changes in the next two steps. In summary, understanding the extent of the consequences of a Business-as-Usual strategy helps management and the company’s board realize the context for change and, determines the urgency with which action must be taken as well as the extent of the changes needed. Once the context of the urgency (timeframe) and extent (degree of change) mandated by the Business-as-Usual Outcomes analysis is understood, the proper transformation process can begin.